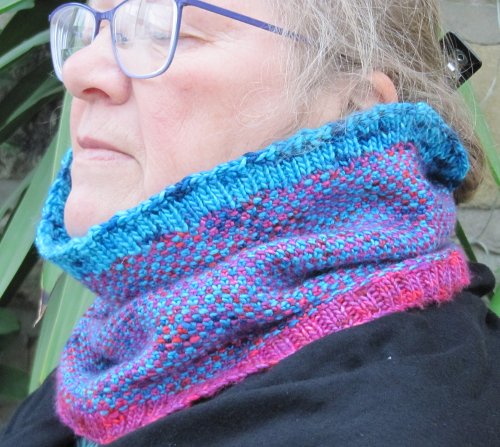 As I mentioned in an earlier post, I have been cataloguing my yarn stash and came across some hidden gems of yarns purchased long ago and with no plan for their use, and I decided to design a simple cowl that would use them up. 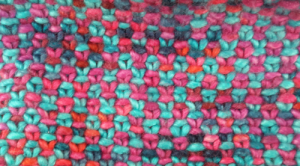 This pattern is part of my Love Your Stash Challenge for 2019, in which I aim to use yarn from stash for a series of simple accessories. The yarns are Louisa Harding Grace Hand-Dyed, a DK weight yarn, in two colours. 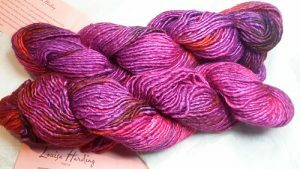 I have two skeins each of Coastal, a gorgeous bright turquoise, and Festive, a rich purple. Both yarns are tonal, and provide a total of 404 metres (440 yards), which is more than enough for a good sized cowl; in fact, I only needed one skein of each for the cowl, using virtually every scrap, so the rest will make a matching hat. 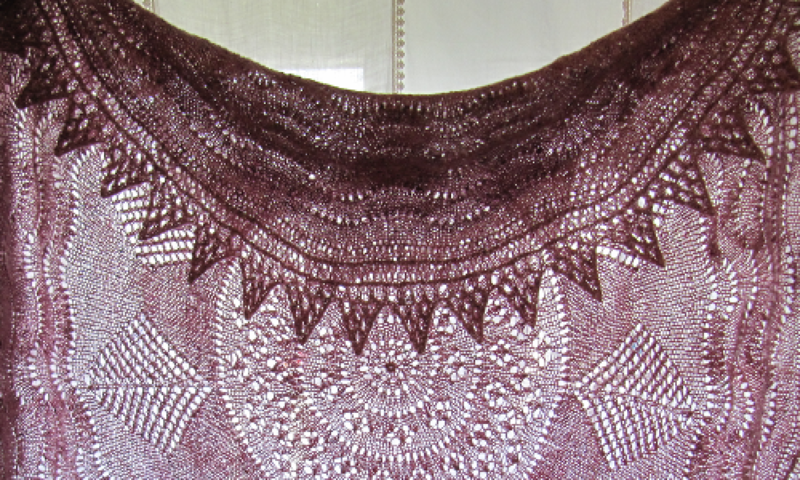 The PDF version of the pattern can be downloaded from my Ravelry Pattern Store. 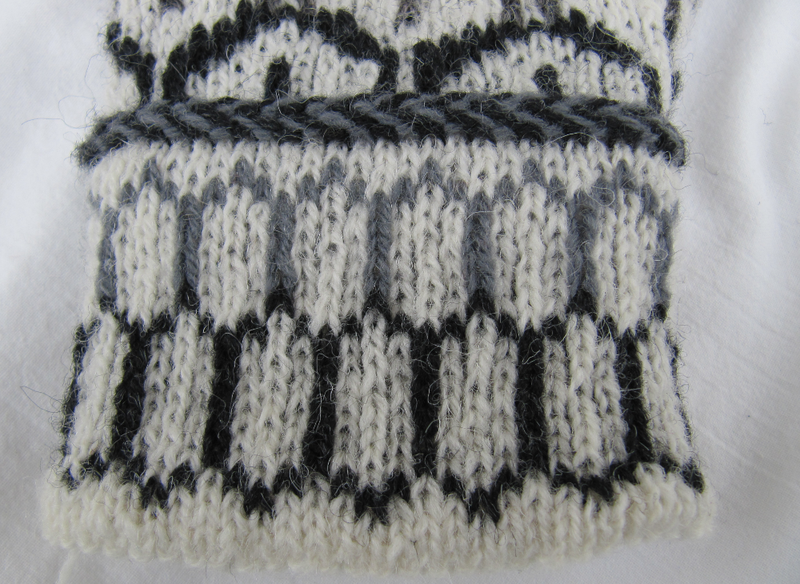 Have a look through your stash, gather your tools together, and happy knitting! 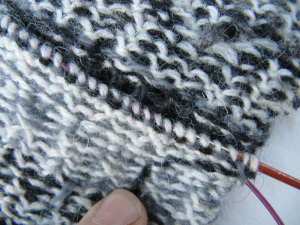 Three-needle bind off is a very useful technique for joining two pieces of fabric. 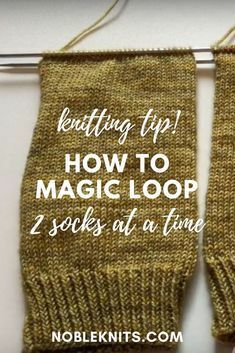 It can be used to create a firm shoulder seam on a sweater, to close the toe of a cuff-down sock (if you don’t want to use Kitchener stitch), or to complete a folded cuff or hem. It is important not to stretch or pull the stitches too much, and to this end I am using 3 different sizes of needle: the inner cuff has been knit on a 3mm circular needle (brass); the purl bumps are picked up on a 2mm circular needle (dark wood); and the casting/binding off is performed with a 3.75mm double-pointed needle (light wood). 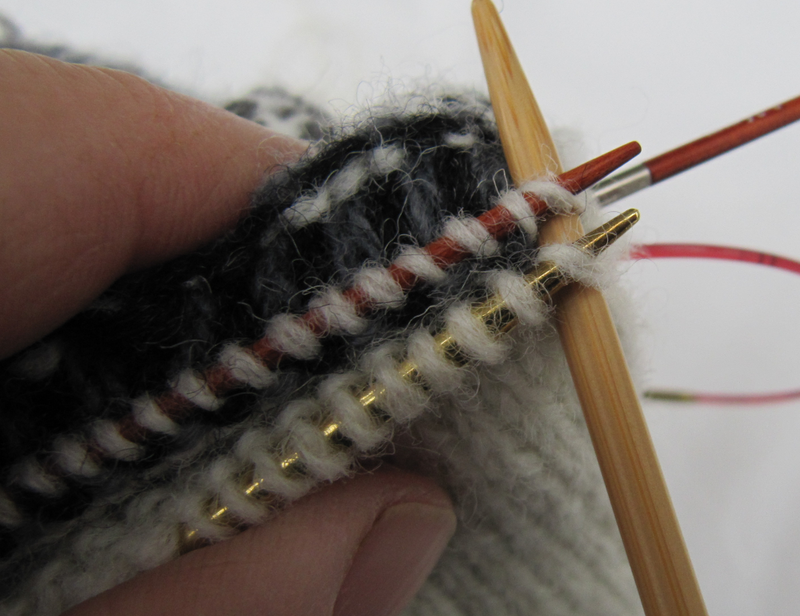 The 2mm needle stops the picked up stitches being stretched out of shape, and the 3.75mm needle ensures that the cuff bind off lies flat and is not ruffled. I shall illustrate the technique using the cuff of a mitten. 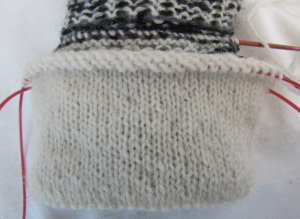 The mitten has been knit top down, with a patterned outer cuff and a plain inner cuff, the inner cuff has been knit to the correct length for folding under, and the mitten has been turned inside out. First, you need to pick up stitches around the beginning of the cuff. 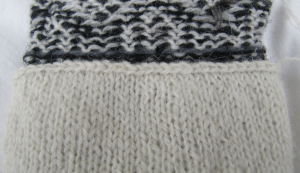 In the example mitten, these are purl bumps and are quite clear, being the background (white) stitches along the lower edge of a Latvian Braid. 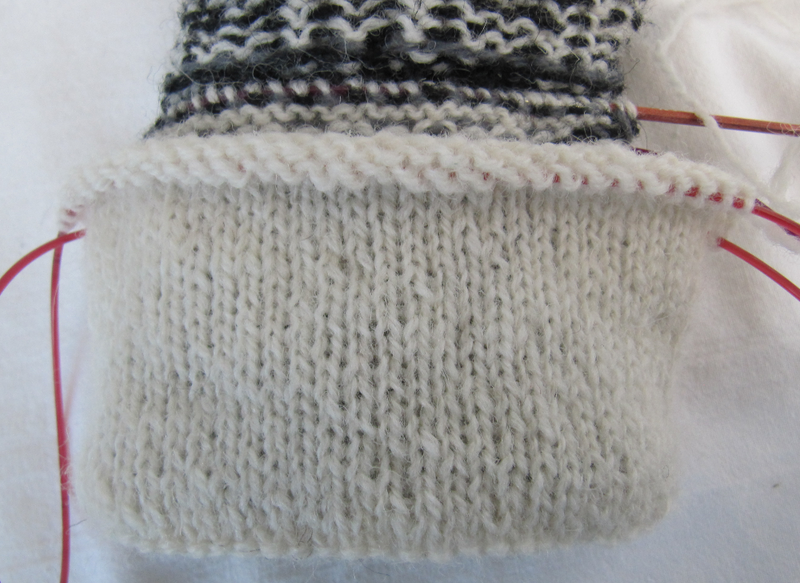 The number of purl bumps to pick up should match the number of stitches to be bound off – in this case, the inner cuff has 60 stitches, so I have picked up 60 purl bumps. 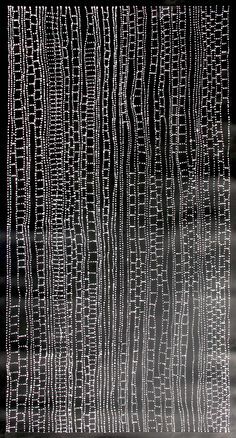 Beginning at the start of the round, place the tip of your 2mm needle into the purl bump as though you were purling a stitch, and lift the bump onto the needle; repeat for the second stitch, and so on until stitches have been picked up all around the cuff and you have the correct number of stitches on your 2mm needle. Next, fold your cuff along the edge line (this is a round of purl stitches at the fold point, designed to help the folded cuff lie flat) so that the live cuff stitches meet the picked up stitches. In this photograph, the purl bumps are on the back dark wood needle, the live cuff stitches on the front brass needle. 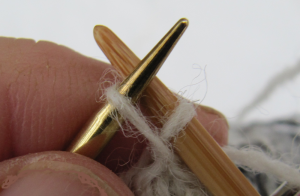 Take your largest needle, in this case 3.75mm (light wood), and put it through both the front and back stitch to knit them together. Knit these two stitches together, and repeat for the second stitch on both needles. 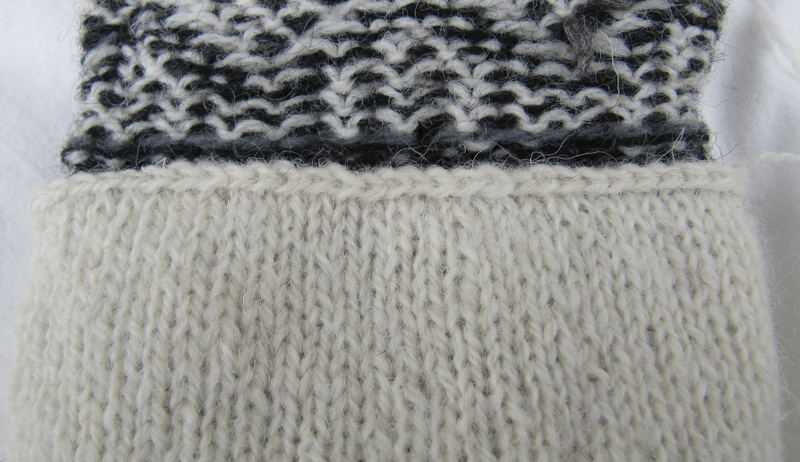 Then pull the first stitch you knitted over the second stitch, as you would do when performing a normal cast/bind off. 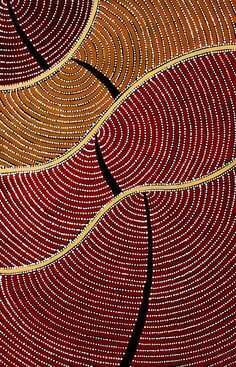 Repeat for the third stitch pair, and so on, until all pairs of stitches have been cast off. I like to neaten the join between first and last stitch, by placing my needle through the first stitch bound off, wrapping the yarn around it and pulling through to create another stitch, then passing the last stitch of the bind off over this stitch. 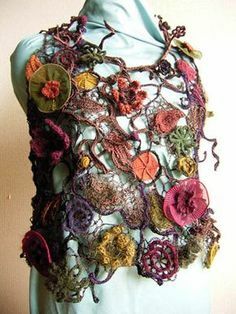 Cut the yarn and pull through the last stitch on your needle. 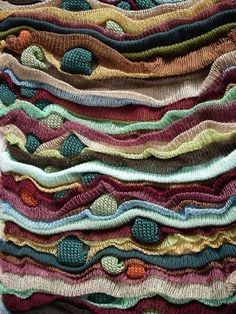 The cast/bound off stitches lie flat and the fabric is unruffled. This gives a nice neat professional-looking finish. 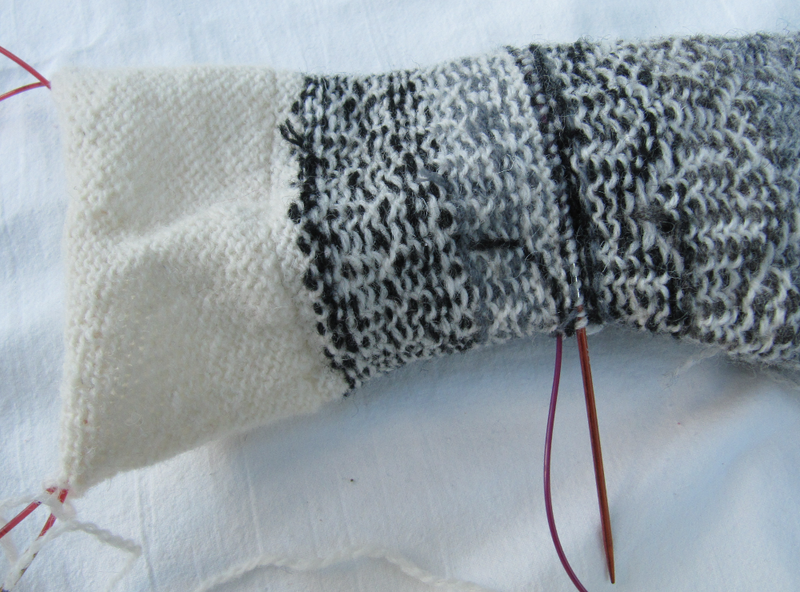 This last photograph shows the right side of the cuff completed, with the Latvian Braid. The join at the first row below the Braid is undetectable.